The Ganga isn’t cleaner than before and the BJP doesn’t seem closer to achieving its 2020 deadline. 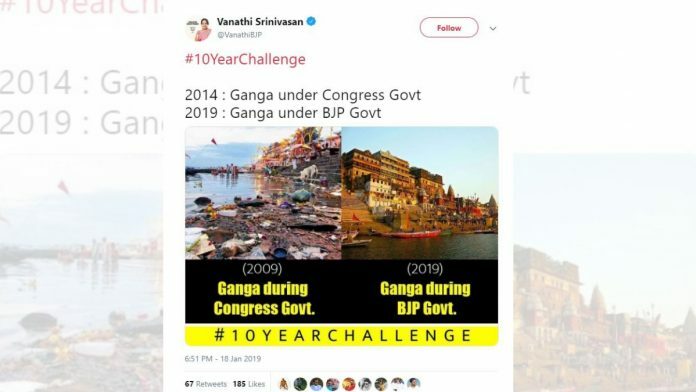 New Delhi: The Bharatiya Janata Party (BJP), which less than two weeks ago used the #10YearChallenge to promote some of its schemes, is now using an old image to bolster its Ganga cleanliness campaign, Namami Gange. BJP’s Tamil Nadu secretary Vanathi Srinivasan originally posted the tweet, collecting over 150 likes. From here, fellow BJP leaders and supporters have shared it across social media portals like Twitter, Facebook and WhatsApp. Namami Gange, run by the National Mission for a Clean Ganga, is one of the Prime Minister’s flagship initiatives that aims to clean up the river by 2020. However, the party has repeatedly been criticised for not succeeding in its mission yet. According to an article by Business Standard published Sunday, only Rs 700 crore out of the allocated Rs 2,300 crore have been used so far. The real catch, though, is that the images in the collage aren’t from the year they claim to be. The dirty river image is, in fact, a recent photo. The image was originally published by Outlook in 2015, and not 2009. The accompanying article highlighted the recently-launched mobile application that was to be used as a “tool to support decision making and planning for the clean Ganga mission”. As for the image used to depict the cleaner river, it is actually from March 2009, not 2019. It was uploaded on Wikipedia in 2009, and originally published by Ken Wieland on Flickr. Despite Modi auctioning his mementos to help raise money to clean the Ganga, the government has been at the receiving end of constant criticism for shifting deadlines and slow movement on the project.